Four musicians who have spent their entire professional lives together find their bonds quickly coming apart after it is discovered that their cellist is diagnosed with Parkinson’s disease. The tragic news hits the group like a tornado just a short time before the group’s twenty-five year anniversary performance. It is decided that their next performance will be the cellist’s last. This change to the group dynamic gives the second violinist the opportunity to confess something that has been on his mind his entire career: he wants first chair. This seemingly innocuous request throws the entire quartet into disarray and puts their allegiances, friendships, relationships, and the future of the group itself in jeopardy. Despite having a cast of top-notch talent, the film ultimately suffers from being too caught up in its own devices to make its characters very relatable. Christopher Walken plays the aging cellist and gives a lackadaisical performance that feels distant and removed. However, over the years we’ve come to know and love Walken’s signature arrhythmic style. So perhaps this apparent laziness was actually just his honing in on his character’s newfound geriatrics. Phillip Seymour Hoffman and Catherine Keener play husband and wife, second violinist and violist, respectively. The two have about as much chemistry in the film as mixing dirt with water. When they begin to question each other’s fidelity, their relationship gets muddy, yet neither puts their heart into cleaning it up. 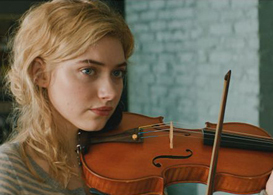 The daughter character is played admirably by Imogen Poots, whose pent up resentment towards her parents manifests itself into an indecent relationship. Finally, Mark Ivanir completes The Fugue on first violin. Who is Mark Ivanir? He began his career inSchindler’s List and audiences may remember him from A Good Shepherd. While not a household name, he certainly holds his own amongst this well-known cast, and actually gives the best performance of the film. Writer/director Yaron Zilberman’s script is wrought with allegories to compare the relationship of the quartet with Beethoven’s Opus 131, a forty-minute piece that is played “attacca,” or without pause, which causes the instruments to go out of tune. While the instruments are obviously meant to be metaphors for the members of the film’s quartet, the emotional transformation when one member takes a break is not gradual as it should be. Rather it is quick and impetuous, resulting out of impulse and not evolution, snapping the musicians to their senses, creating an avalanche of indiscretions that ought to lead to more fully aware characters and a satiated audience. Yet despite all of this, the characters’ epiphanies end up as irrelevant and the aftermath is completely ignored so that the quartet, the entity that has allowed these characters to live unfulfilled lives, can continue to thrive. A Late Quartet hits theaters November 2nd. Watch the trailer.